If you’re a house owner, especially one who lives in an area where the weather is usually rainy, then you know the challenge a roof leak can pose. Before fixing a roof leak, you have to find it, which can be even more difficult than the actual repairing process. Today, we’re going to lend you a hand with roof leak repair by talking about how you can identify a leak and repair it according to the type of roof you have and the causes of the leak. How Can You Identify Roof Leaks? The reason why people find it hard to figure out where they can find the roof leak that’s been bothering them is because usually, the place on the ceiling where you notice the leak is not the place where the water entered the roof. Water doesn’t run in a straight line from the roof to the ceiling. Which is why when you want to identify the leak, you’ll have to think like water. What this means is you have considered the trajectory of the water according to whether you have broken or missing shingles, a poorly sealed roof, and so on. The first step to identifying a roof leak is going to the attic in broad daylight while holding a flashlight. Start checking the roof above the drip and move upwards looking for wet spots. If it hasn’t been raining for a while and you can’t find any signs of wetness, you have two other options. The first one is to check for stains, water marks, or discolorations that the moisture made on the wood. If you’re able to find those, you’ll most likely also find a hole in the roof where the light passes through. The second option involves a water test. For this test, you’re going to need someone else willing to help you. That’s because someone will have to take a garden hose and go on the roof, while the other person takes a flashlight and a bucket and goes in the attic. The person on the roof will use the hose to flood the roof, starting from the bottom up. The one in the attic will carefully look for the leak and mark the spot. The process of repairing roof leaks depends on the type of roof you have. Is it made of shingles or shakes? Is the leak caused by the connections between your roof tiles? Let us now explore four roof leak repair techniques that don’t require professional assistance. Shakes are really similar to shingles, but they do sport a couple of differences. First of all, a shake is split either on one or on both sides, while a shingle has both sides sawn. Shakes are also thicker and manually made. If you have a roof made of shakes, and you’re looking for the best roof leak repair method to prevent water from getting inside your house, then you should look for damaged shakes. Once you’ve found them, you have to use a chisel and a hammer to split them. The chisel should be able to fit under the shakes and help you remove them. If there are any nails that won’t budge, we advise you to use a hacksaw to cut off their ends. Just make sure that the sawing doesn’t damage any of the good shakes. Now that you’ve successfully removed the damaged shakes, it’s time to prepare new ones that can replace them. One of the most important things you should be aware of when doing this is that you’ll have to cut them about 3/8 inches smaller than the old ones. The best way to secure the shakes in place is by using galvanized roofing nails. Then, use a nail set to set the heads and some caulking compound to seal them. If your roof is made of shingles and you’re experiencing a roof leak, the first step in a complete roof leak repair is to check whether the leak is due to damaged shingles that you have to replace altogether or due to curled ones that you can fix. If the issue is curled shingles, you’re going to have to use a heat source to help you straighten them. We recommend an electric hair dryer, since an open flame might be more dangerous and could also potentially ruin the shingles. After using the hair dryer, take some asphalt roof cement and straighten the shingles. Then, simply reattach them to the roof. If some shingles are too damaged for you to fix, it means you’re going to have to replace them. Removing them shouldn’t be difficult since damaged shingles are easy to take out by simply lifting the edges. Make sure that there’s no roofing cement left underneath them. Then, add the new shingles after you’ve rounded their back corners. Secure them with nails and use roof cement to cover the nail heads. Another thing that might require a roof leak repair are the areas where different types of surfaces connect on your roof. Typically, if the caulk is damaged, it can allow water to seep through. In this case, all you have to do is simply reapply it. Before you do that, carefully remove all of the old caulk. Also, thoroughly clean the area and then allow it to dry. Finally, the last roof leak repair technique that we wanted to talk about relates to repairs in the roofing material that might experience blisters or cracks. The way to mend it is to take a knife and cut a line in the middle of the blister. Make sure not to penetrate the roofing felt underneath. Then, making sure there’s no water inside the blister, spread some cement under the material, press it down, and use nails to secure the repair. The roof leak repair methods we presented above are some of the most common and useful ones, regardless of the cause of your roof leak. 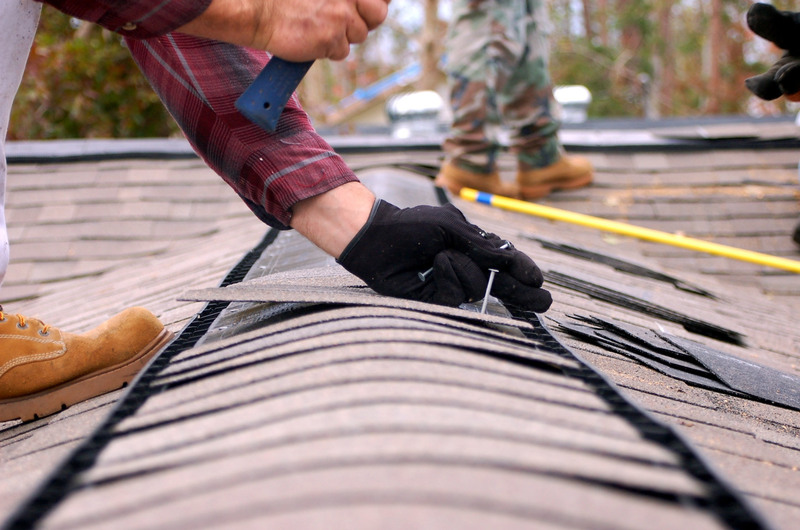 We hope they’ll help you deal with minor roof leaks without having to call a professional. However, if you notice a more severe issue with your roof, asking for help is definitely the best course of action.